Okay some of you have this step already so bare with me while i go through it. I'm going to show you a different way to get the moon beams. If you did it the way I did in Meav's that fine too. 1. With eyedropper tool pick a color from the background. 2. The new color should be the foreground color and white should be the background color. 3. Make a new layer. 4. Make a selection with the lasso tool similar to mine, (the arrow should be pointing to filter not layer) go to Filter>Render>Clouds. 5. You should have this now. Hold down Crtl + D and unselect the section. 1. Now go to Filter>Blur>Gaussian Blur and set it to 25 pixels. 2. You should have this. 3. Set the layer mode to screen. 4. Adjust the layer's opacity to about 63%. Repeat these steps for the following sections but when you adjust the layer's opacity make them all different (ex. some 43%, some 60%, some 55%) this will give you more of a look of different beams of light coming in the window. We don't need to do the windows that are down the hallway because that is overkill. You may have noticed I missed a screen shot. Just make sure you have beams on the two closest windows in all or most of the openings that you think light would come in. Great stuff Tamberia! Most of my graphic design experience comes from "functional" art such as web layouts, logos, letterhead, etc. Those kinds of "business style" designs. It's great to be learning some more fantasy, beautiful type of art!! Someone following the tutorial turned the word doc. into a pdf. file for anyone who wants it in that format. This is like John Madden using his telestrator for football! See ya go through this gap and paint this and BAM there she is!!!!! Fun stuff! Scott. You know there are over 40 screen shots to this tut and I still didn't get all of them. OH YEAH, PARTY!!!!! you will love it Destiny. You will wonder how you got along without it. Okay open hayley or anyone you want to place in this scene. 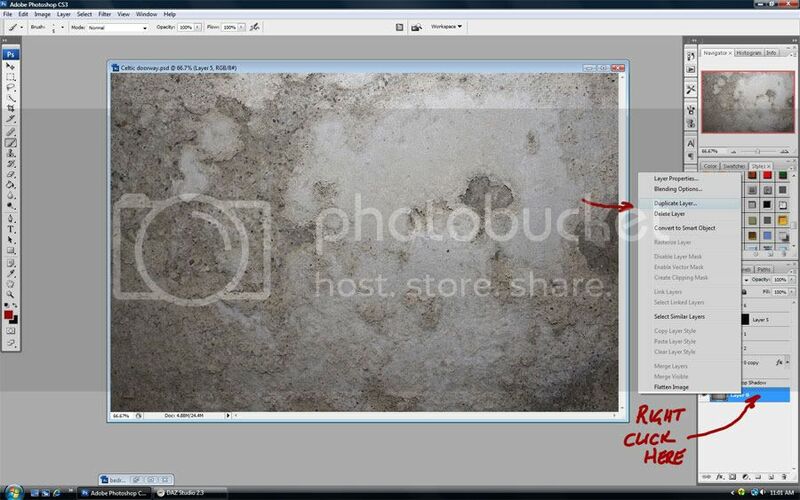 Now Photoshop has Quick mask but Elements has a brush selection tool. You can use it to select Hayley and then do a very neat trick With the move tool selected Click on the the selection of Hayley hold down the left mouse button and drag hayley from her image into our image. You can do this in Photoshop as well. Hold Down Crtl + T and we will resize Hayley. To resize just click on one of the corner squares surrounding Hayley and adjust. Now I want to change the color of Hayley's dress to blue 1. Make sure Hayley's layer is highlighted 2. Go to Layer>new layer adjustments>Hue/Sat. 3. In the pop-up window make sure "group with previous layer" is checked. Click okay. Use the settings I have used. Make sure Colorize is checked click okay. Make sure the layer is grouped. Don't worry that Hayley's skin is blue we are going to fix that next. 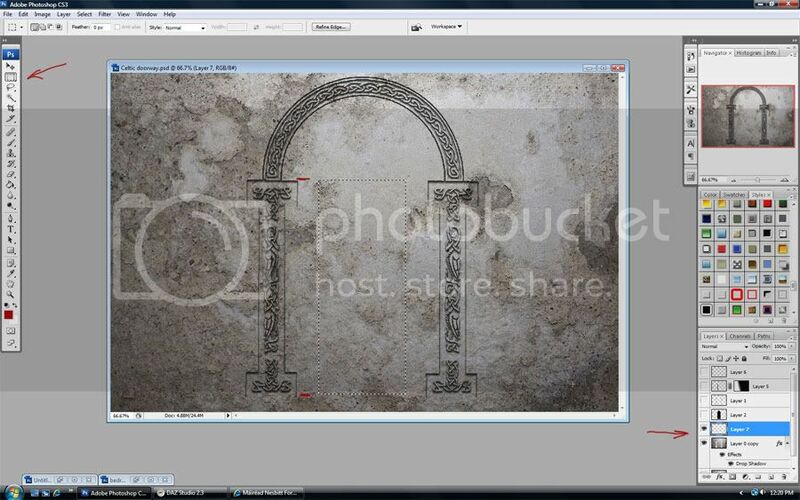 Now make sure the Adjustment layer is highlighted and click on the layer mask. With the brush tool and black as your foreground paint out the blue on Hayley's face and skin be careful around the dress. Now go back to Hayley's layer and highlight it. Then go to Layer>New Layer Adjustment>Hue/Sat. This time DO NOT Check Colorize and only adjust the Saturation and lightness to adjust Hayley's skin. That's the end to this step, up next the sparkle and motion behind Hayley. I going to give a quick shadow tutorial here for some of you who don't know how to do it. I have taken Lisa from the stage and put her in this image. She really doesn't look like she belongs there. Well before we add shadow we need to figure out which way the light is coming in. If you put her in a scene look for existing shadows to figure that out. 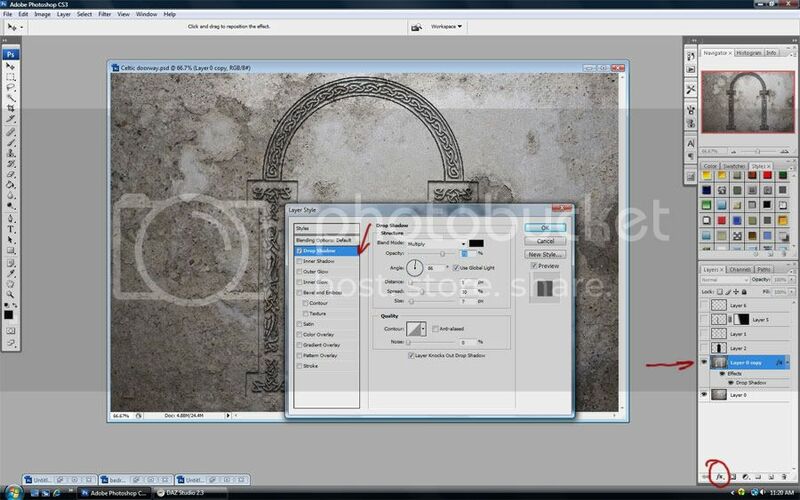 Now hold down the crtl key and click the window on lisa's layer to select her. Then add a new layer and make sure it is highlighted. With black as the foreground color use the paint bucket tool to fill the selection with black. Looks like we lost Lisa! but we haven't she is still there. With the shadow layer still highlighted click on it and hold down the left mouse button and drag it down behind Lisa's layer. Now we need to move the shadow. Hold down the Crtl key and press T. If you move the cursor over the inside of the box you get a pointer, but outside the box near the corners you get a curved arrow that means rotate. Now rotate your shadow the way I have. Now depending on the light source is how our shadow would be. If it was hitting Lisa from a side angle it would be a long shadow, if it was hitting Lisa from above and slightly to the side it would be a short shadow. Like the image below. I going to use the longer shadow for this lesson because there is something I want to show you. Once you have your shadow positioned, hit enter and go to Filter>Blur>Gaussian Blur. Adjust the size of the blur to want you feel is a good amount. It stll doesn't look right so I am going to flatten the shadow to make it look like its on the floor. Hold down the crtl key and press T. Now if you hold down the shift key and pull on one of the corner squares the shadow's scale changes, but if you hold down the Crtl key and pull on one of the squares it skews it. Do this until the shadow lies flat. Okay it pretty convincing but not enough. In some cases you need to fade the shadow. On the shadow layer create a layer mask. Click on the layer mask and add a gradient to the mask. Make sure you use a white to black gradient and start from the x on Lisa's dress to just beyond the shadow. It should give you a nice fade to the shadow. When using scenes you have to decide if a fade is needed. It all depends on the light and the scene. Thanks for the shadow lesson. I have always had a hard time with creating this effect. Okay next step. With our Hayley image open create a new layer. Using white as our foreground color go to the brush tool, click the arrow next to the current brush, in the sub menu click on the two arrows and you will want to load some brushes that I am going to have you download. I keep mine in a folder on my desktop named ps brushes. Makes them easy to find. Load up the Sparkle brushes. Now on the new layer pick a sparkle brush and paint some sparkles, adjust the brush size to make it appear to get smaller as it goes down the hallway. Set the layer mode to screen, and adjust the opacity to something you like. Next go back to the brush sub menu and load the reborn brushes. Create a new layer and on this layer add the special effect like you see below. You have to use the tranform tool to get it to look like it is flowing up the hallway with Hayley. Remember if you hold down the crtl key while pulling on the squares of the transform tool it will skew the image on the layer. Then create another and add another reborn effect and move it around into place with the tranform tool. 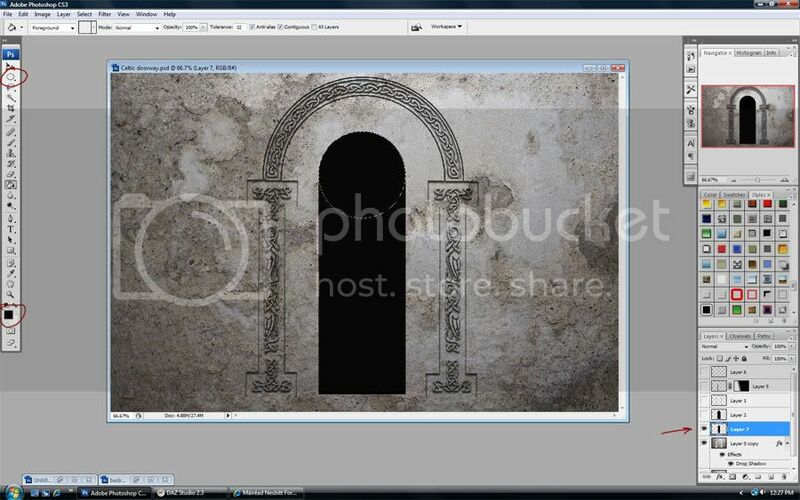 Set both layers to screen and adjust the layer opacity to suit you. Now for the dreamy effect. Hold down the Crtl key and press A. The go to edit>copy merged. Then hold down crtl key and press V twice. You should have to new layers at the top of the layer palette. Click on the top layer to hightlight it. Go to Image>Adjustments>Desaturate. Then go to Filter>Blur>Gaussian Blur. Pick an amount that gives you a little blur. Hit okay. Go to the layers palette and set the top layer mode to multiply. Lower the Layer opacity until you get something close to mine. That is it for this step, next the finishing touches. I used 1680 x 1050 if you are going to use fonts use a Resolution of at least 200 pixels. Fill it with Black. Then open up the cosmos image again and copy and paste it into our image. Resize it to fit. Then reopen the our image of Hayley, Hold down the Crtl key and press A. Go to edit>Copy Merged. Then paste Hayley into our new image and resize by holding down the Crtl key and pressing T.
The Cosmos layer is not leaving me enough border so i resize it again. 1. Now click on the little square in the layer palette 2. Create a new layer. 3. 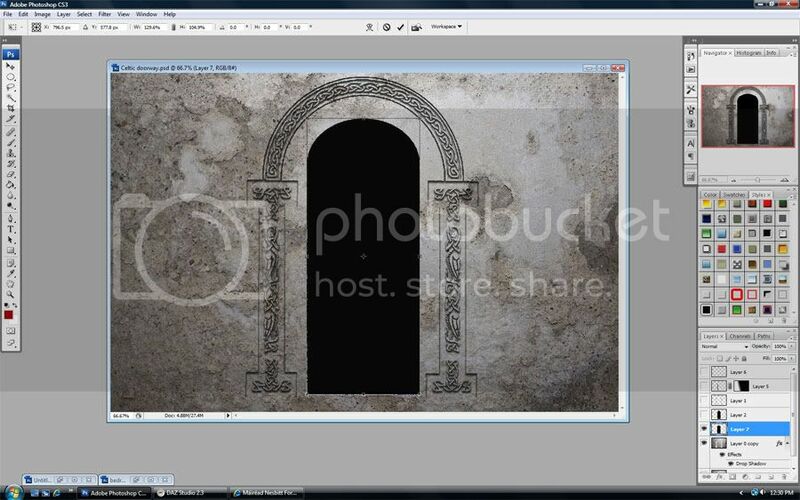 Hold down the Crtl key and move your cursor over the window on Hayley's layer and click. Selecting it. With new layer highlighted fill the layer with white. Then go to Select>modify>contract set to 5 px. Click okay and then press delete. Now go to the effects menu on the right and click on FX, photoshop users go to styles. look for the one named Star Glow. Then select the text tool and Add text. I use Ruritania font. Make sure you have white as the font color. Click the black and white circle in the layers palette and use the following settings to create a style. Lighting angle 120. Drop shadow checked, size 12 color black, distance 4, opacity 75%. Stoke checked, size 4 color white, opacity 100%. hit okay. Then on the same layer click the star glow fx style again and it will fill the font like mine. 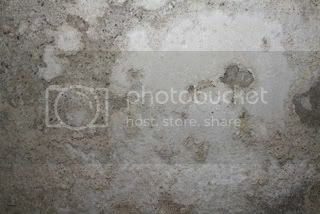 and a rock wall image, you can use this one http://i248.photobucket.com/albums/gg173/Tamberia/bigstockphoto_Concrete_Old___219005.jpg if you need to. I will be back later with the first steps. 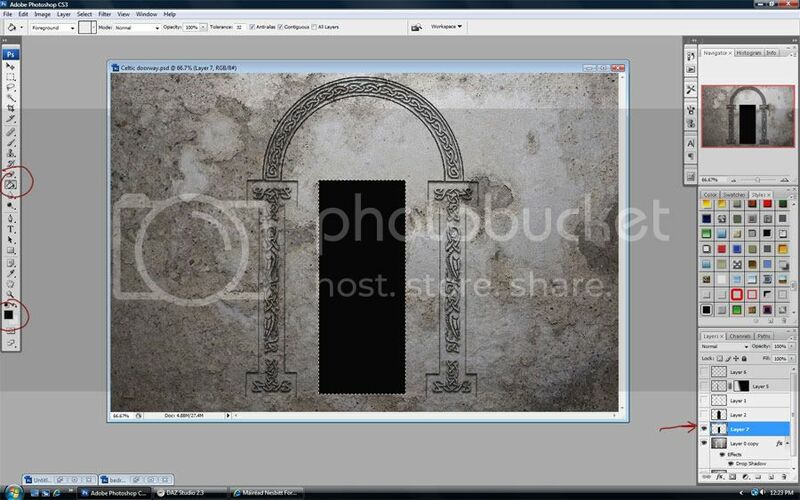 open your wall image and right click on the layer. Duplicate the layer. create a new layer, set foreground color to black, select the arch frame from celtic brushes and paint the frame on the layer. Then select the magic wand and click on the black in the frame to select it. Hold down the shift key to add selection as you click around the whole frame. Make sure you also click on the clear area to get the outline of the frame. When you get the selection looking like mine select the duplicated layer so the selection will be on the duplicated layer. Press the delete button and turn off the selection by hitting crtl + D. Also turn off the arch layer above the duplicated layer. go to the bottom of the layer palette and click on fx to add a drop shadow use the settings I have to create the craved look. create a new layer and go to the Marquee tool and make a rectangular selection on the new layer from the points I show on the image. Use the bucket tool and use black and fill the selection with black. Stay on this layer. Now change from rectangular Marquee tool to and oval. Hold down the shift button and create a round selection at the top ot the rectangular selection. Holding down the space bar and the left mouse button will let you move the selection around. Fill the selection with black. It looks okay but not big enough so we need to fix it. use the tranform tool (crtl + T) to resize the doorway.